Published by the Chicago Tribune, this magazine contains fascinating articles about products made in the Chicago suburbs. 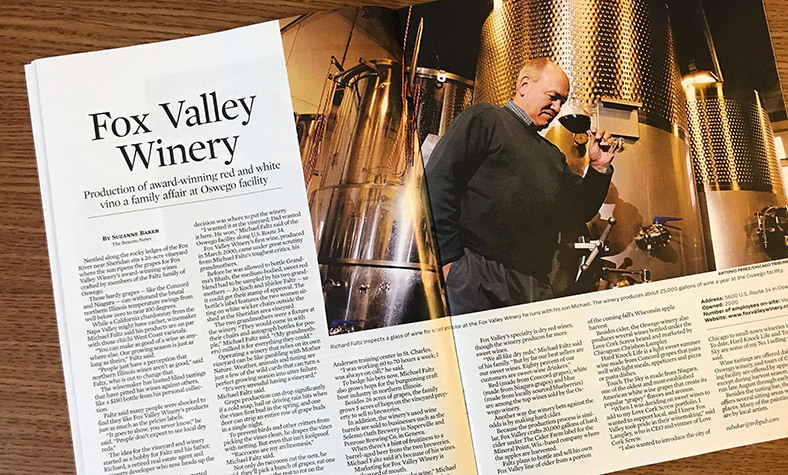 The Fox Valley Winery was featured in one of the publications, with Richard Faltz pictured inspecting a glass of wine for smell and color. Richard runs the winery with his son and winemaker Michael Faltz. The winery produces about 25,000 gallons of wine a year at the Oswego, IL facility. The 26-acre vineyard is located along the rocky ledges of the Fox River near Sheridan, IL. Fox Valley’s specialty is dry red wines, though the winery’s best sellers are their sweet wines. Wine tastings are offered daily at the U.S. Route 34 facility in Oswego, with tours available by appointment only. The building also offers a tasting bar, two fireplaces, room rental, and many crafts from local artisans.